Abby of Sandhills Dog Training has done so much to help me build a fantastic relationship with my rescue dog, Olaf. I called her the first week we brought him home and it was a decision I am SO happy I made, because it truly changed my life. It’s hard to say who got more out of our time spent with Abby: Olaf (the dog) or me! Abby has been absolutely instrumental in helping *me* to understand how Olaf learns best, and a part of that of course includes the most efficient way to teach him something. Without this knowledge I could (and did) spend days trying to teach something that he can actually learn in minutes given the right approach. All dogs are different, and our work with Abby has really helped me to connect with Olaf through this understanding. She was as much a trainer to the dog as she was a counselor to me to help guide me through different challenges we face – both from the perspective of the dog and the owner! The bond Olaf and I have is more than I ever expected, especially as we haven’t even had him for four months yet. I can take him out longboarding and he will even go stand up paddleboarding with me, content to sit or lay on the board for up to five miles at a time (more than an hour!). This is something I never would have imagined I could do so soon with him, a puppy that is still not even one year old! Abby continues to provide valuable resources to me as an individual and regularly shares articles that continue to help Olaf and I work together. She is an absolutely wonderful human being that sees the best in everyone – canine and human. I cannot recommend her enough! Fostering dogs from the Animal Center of Moore County is both very rewarding and challenging. Many of the dogs placed in foster care are great dogs with lots of potential but they have some behavioral issues. They just need a little help to get around their issues so they will be ready for adoption. Our job, as a foster parent, is to evaluate the behavior, work to change the inappropriate behavior and then recommend the best environment in a forever family home. Abby has been a valuable resource for us. She listens to us and then observes the dogs. She sets clear, realistic goals. She is patient with the dogs and with us! Her training techniques are understandable, doable and fun for us and the dog. She has helped our foster dogs get prepared for their forever homes. One of the other very important jobs of a foster parent is to make sure the dogs receive lots of consistent attention and love. Abby’s training is calm and supportive within the context of respecting the dog and sharing dedicated affection. Bailee was adopted from the Moore County Humane Society last fall. We were the second family to adopt her. Immediately after bringing her home, we noticed she was scared of everything. Noises, objects, people (especially men) . She warmed up to us and started to get more comfortable in our family, but was still very fearful of things. So, I decided to enroll her in a basic dog obedience class with Abby Ganin-Toporek from Sandhills Dog Training. On Bailees first day of class she was very afraid to go inside. But once inside she immediately felt comfortable with the other dogs, but was fearful of their owners. In the six week session I saw little improvement, until the last class. She went onto and over the "dog bridge" that she was so afraid of the first class. What excitement and praise she got! She seemed confident. I wanted to continue with training, so I enrolled her in a second basic dog obedience class. It wasn't until the third class I saw the greatest change. She was no longer scared to go into the building where classes were held. She was excited! Throughout the remaining sessions, Bailee was even used for class demonstrations. I could see the change in her. She is still fearful of things from time to time but I can see a confidence in Bailee she didn't have before. 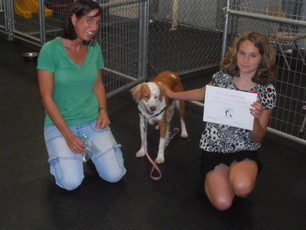 We will continue to practice what we have learned from Abby at Sandhills Dog Training. I highly recommend Sandhills Dog Training LLC, owned and operated by Abby Ganin-Toporek, CPDT-KA to anyone with dog training needs. The training classes are active, fun, and enable you to learn quickly. It is easy to see progress with each session; in fact, it is amazing to see how quickly the dogs respond. Abby clearly loves the animals and loves working with them. She is a true professional and we are so fortunate to have someone of this level of expertise and interest in our area. 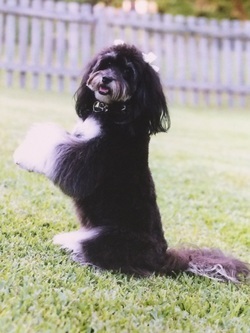 My little malti-poo, Gracie, and I began training with Abby in the fall. 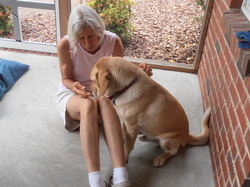 She was nine months old and we had several private lessons before we began Basic Obedience Class. Next we enrolled in the Canine Good Citizen Class and she did great. Thanks to Abby's kindness, patience, and great sense of humor we have truly had a positive experience at Sandhills Dog Training. Classes are the highlight of our week. At the end of each class, we are excited about coming back for the next one! We are currently having so much fun together in the relaxed environment of Trick Class. We are training to take the TDI test also. Hopefully, we will become a therapy dog team one day. There is absolutely no way we will be able to reach this goal without Abby's encouragement and knowledge. I appreciate all that Abby is doing for us and will sing her dog training praises whenever I get the chance. I wanted to express to you how much Mike and I have enjoyed the training sessions you have done with Max and Millie. It’s been amazing to watch them with you and see how effective you have been with them. Mike and I feel that we have learned so much. You have been so patient and explained the techniques so thoroughly, which Mike and I have truly appreciated. Your explanations have been mostly for us as Max and Millie have responded instantly to you. Reinforcing your efforts have been fun and rewarding. We love our dogs so much and want well-behaved dogs so others will enjoy being around them. Your sessions are helping us to achieve those goals. We are interested in taking more group classes to expose Max and Millie to being in group-training sessions with other dogs. 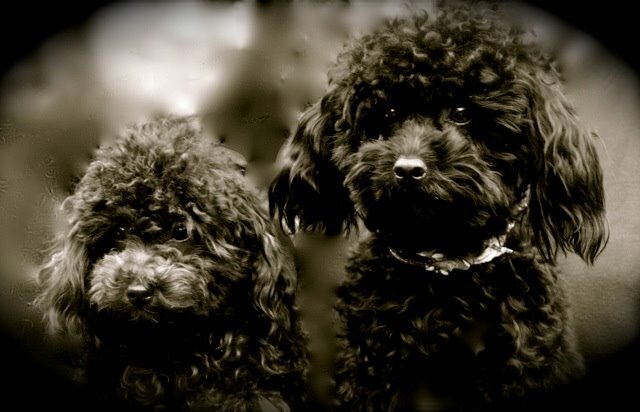 We would recommend you to new dog owners or for “seasoned” owners who want to have better interaction with their dogs. It’s so well-worth the efforts involved in the love and care of/for our dogs. THANK YOU, Abby. It’s been a pure pleasure. 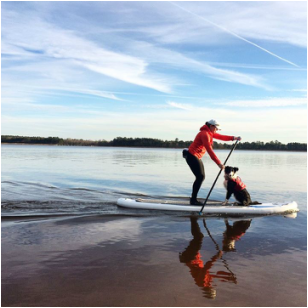 Dog's Best Friend is enjoying a special relationship with our trainer consultant, Abby Ganin-Toporek, CPDT-KA of Sandhills Dog Training. We are so pleased with the response to the training classes offered at DBF by Abby. Her instinctive talent for bonding with her dog clients and understanding their behavior is remarkable. As for her human clients, her training involves explanation, demonstration, coaching, and encouragement while she shares a variety of creative tricks using rewards and treats to motivate her canine students and provide positive reinforcement to achieve those desired behaviors. Her clients always leave with written information and instructions to help with reinforcing what is taught during each lesson. 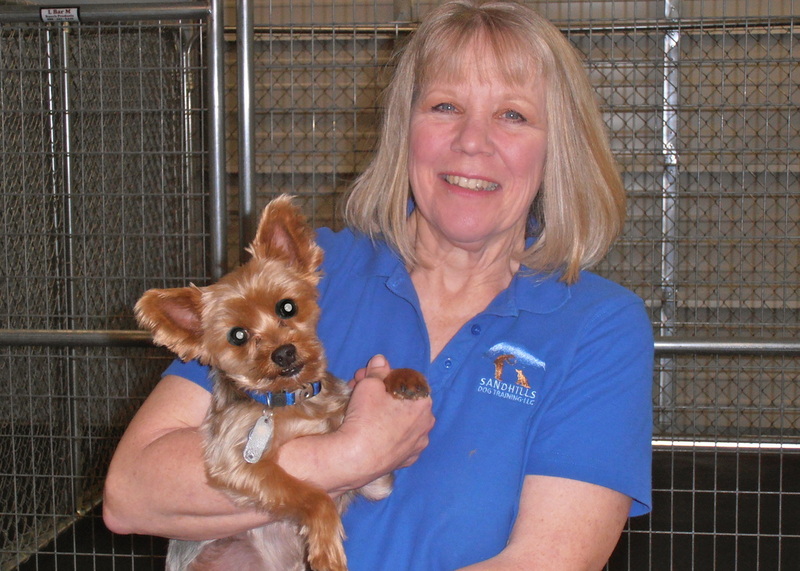 We have experienced Abby's expertise first hand with our seven year old Yorkie. Max joined our family two years ago, and we immediately realized he had a couple issues that were going to be quite a challenge to address. 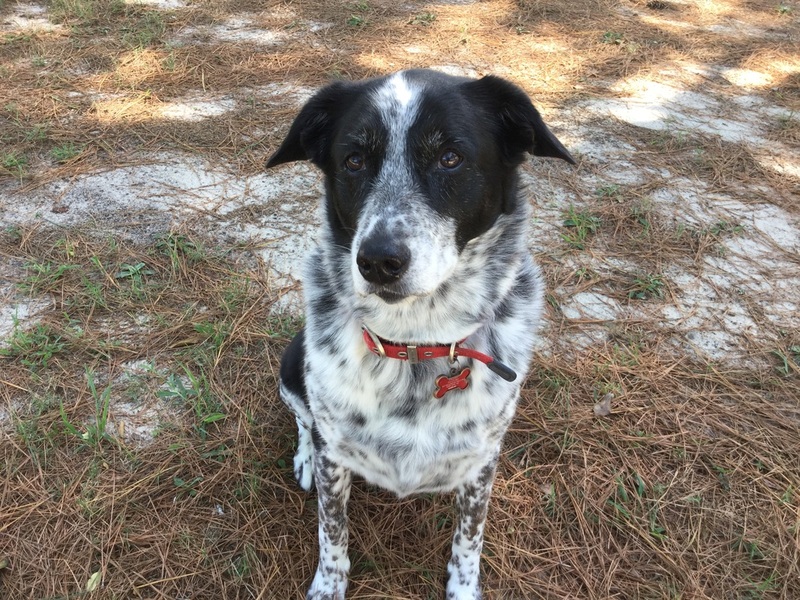 We called on Abby, and she gave us instruction on how we could illicit the desired behavior and use ongoing positive reinforcement to change the undesired behavior. We followed Abby's directions, and have been amazed at how well and how quickly Max has responded. With these issues resolved, Max is a happier, more confident member of our family. If you are having behavior issues with your dog, or if you want to work with your dog on manners, basic obedience, or socialization, Abby can certainly help you. She offers private lessons and a variety of classes and training opportunities that will surely meet your training needs. Abby's training and guidance allowed us to acquire the skills to build acquire the skills to build a better relationship with our dog" and strengthen our bond with our best friend. We couldn't be more pleased to have a trainer of Abby's caliber to provide training opportunities to our DBF clients. Thank you, Abby. My dog Annie – a Canine Good Citizen – who says you can’t teach an old dog new tricks?! Of course, it never would have been possible without your help and guidance. Thank you so much…..for your expertise, your patience, your positive approach to training and your sense of humor during those frustrating moments. Your work with us has not only resulted in a much more disciplined dog, but has also deepened the relationship between Annie and I….and that is priceless! Many, many, thanks. 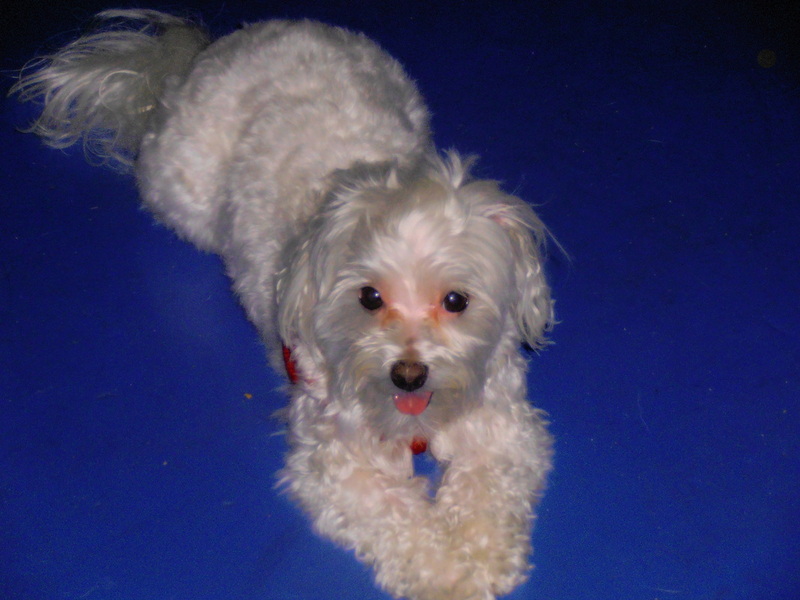 My little Maltese dog “Punkin” is 4 yrs old and had never really been socialized much with other dogs as well as with people. After moving to Seven Lakes, NC where people and their dogs are so friendly, I realized that if I was going to enjoy life here to the fullest, I had better get down and get some training for both me and Punkin. I called Sandhills Dog Training, run by Abby Ganin-Toporek. Abby came out to my house and assessed Punkin’s behavior as well as how I deal with the unwanted behavior. She basically told me that it takes knowledge, time, diligence and patience to change the unwanted behavior in my dog. Knowledge coming from her and the deligience, patience and time coming from me. Boy was she ever right. I have been doing the training regularly with Abby and have seen quite a change in, not only Punkin, but me too in so far as dealing with this behavior. I would encourage anyone facing issues with a dog to try this out. Take the time and patience to follow through with all the steps and you will find your life as well as the dog’s life will be ever so much better. "Ever since my rambunctious Lab mix rescue puppy, Bo, came to me this summer Abby has been a fabulous help in the early training process. House breaking, socialization, puppy obedience--all have been easier thanks to Abby's kind, patient (with owner also) and highly effective training methods. Thanks, Abby, for getting us off to a great start!"